'I hope you don’t mind me contacting you again,but thought you might like a progress report on our beautiful Tiddles! She is an absolute star,& is an entirely different cat to the thin & rather quiet puss who first came here. We had only had her a week when my husband suffered some ill health and spent a week in hospital - thankfully he is recovering well. Tiddles was a wonderful companion and comfort to me while this was going on,& I don’t know what I would have done without her.She seemed to know when I needed a bit of cheering up & would come & jump on my lap. 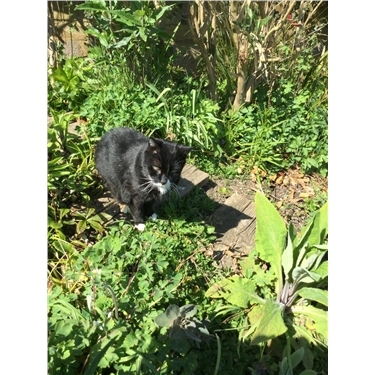 She is very confident now,& has a wander round the garden occasionally,but doesn’t go far,& is usually back indoors within half an hour,having checked out her territory! She also has a miaow which can shake the walls when she thinks it is feeding time,or she wants us to get up in the morning !! Her Arthritis has improved beyond measure,& our vet says to try and avoid any medication as long as Tiddles is comfortable.